Still working on the manuscript... Every time I think Boyfriend Club is almost done, there's more to do. But I stand by the conviction that good writing is good re-writing and I want this book to rock like an earthquake. So this weekend, I'm totally going without any distractions. I won't even be answering the phone, unless it's to call Mel, who I have to confer with several times a day. I'm sure she's completely sick of me and my book. Too bad for her (insert evil laugh in here). When I finally turn in this manuscript, I'm going to treat myself big. One of the things I'm going to do is read Madeline Hunter's new release Ravishing in Red. Isn't that a great title? MH is my favorite historical romance author. The book trailer is so yummy it makes my mouth water. Andrea at The Romance Dish gave Bunco Babes Gone Wild a very tasty review and 4.5 stars. Yay! You can read about it right here. She's also giving away a copy of the book, so make sure to leave a comment! 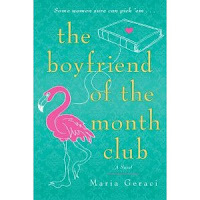 The Boyfriend of the Month Club cover! So I know it's a little premature, since the book doesn't come out till December, but I just can't keep it in any longer. I have a cover! At least I have a preliminary cover. I really hope nothing changes because I really just love this look so much. It captures everything about the book. Stud? Dud? Stick in the mud? Thanksgiving is ten months away (or 2 months ago, depending on on how you see things) but I woke up this morning bright and early, thankful for so many things. 1. I am thankful that everyone in my family is alive and well. My 16 year-old daughter totaled her car yesterday morning on the way to the school. About ten minutes after she walked out the door I got a call on my cell phone from her and I just knew she'd been in an accident. It's been raining for a couple of days straight with some severe flooding in town and I've cringed every time she's gotten in the car. The good news is no one in the 3 car accident got hurt. And the accident wasn't her fault;) The bad news is that now we have to get a new car, but I'm not complaining. The alternative scenario is too scary to think about. 2. I'm almost done with The Boyfriend of the Month Club. It's rough and needs polishing, but I think I'm going to make my deadline. Yay! Plus, I got to see an unofficial sneak peak at the cover and all I can tell you is that the Cover Gods have been very very good to me. 3. Today I have my FPHRW meeting. I love these meetings. I always get so revved up. Plus, honestly, I need to leave the house. This hermit/writing thing is not good for me. 4. I have a hair appointment Monday morning, which means my kudzu growing roots will go bye-bye. 5. And lastly, I recently received this very nice review for Bunco Babes Gone Wild from the Chicklit Romance Writers. This morning, after seeing yet another front page of the horrendous devastation done by the earthquake in Haiti, Mike Geraci turned to me in disgust and said, "Why it always the poorest people in the world always get the shaft?" Because I'm writing like a fiend right now, I'm pretty much ignoring my email. But I had to open this one. It's brilliant. For every 10,000 points you turn in, Hilton will donate $25 to the Red Cross Haitian relief effort. I don't know if other companies are offering similar deals, but it's a fantastic idea. I turned in all my points (which I rarely even remember to ever use anyway). If you're a member of the Hilton Honors program, all you'll need to provide is your name, your HH act number and how many points you'd like to donate (in increments of 10,000). Dear Hilton HHonors Members: Help the Earthquake Victims in Haiti. Hilton HHonors® has partnered with the International Federation of Red Cross and Red Crescent Societies to help victims affected by the January 12th earthquake in Haiti. If you would like to support the effort we have arranged for HHonors members to be able to donate points to support relief efforts. For every 10,000 points you donate, we'll send US$25 to the International Federation of Red Cross and Red Crescent Societies. If you would like to join us in supporting the victims of the earthquake in Haiti by donating points please visit us here. Ah, there's nothing like the feel of a freshly made warm plastic toy in your hand. Put one up to your nostrils, and it even smells like summer vacation. And fighting with your sister in the back seat of the family car (no seat belts required) and drinking icy cold RC cola out of a glass bottle. One of the best parts about writing my new book has been the research. If you're old enough to remember Mold-A-Rama machines, then you might get a kick out of knowing that one of these ancient puppies is featured in my new book, The Boyfriend of the Month Club, a romantic comedy due out December, 2010. A lot of the action in the story takes place at Florida Charlies, an old fashioned Florida tourist trap. Although Florida Charlies is a figment of my imagination, it's modeled after the dozens of roadside stops and attractions that were so popular in Florida during the 1960's when I was but a wee thing. And the best part of a lot of these places were the Mold-A-Rama machines. For about a quarter, or maybe 50 cents, you could watch this strange space-age looking machine make a wax figurine just for you. My favorite was a bird figurine from Busch Gardens (Tampa) which I understand now has some of these almost antique machines still in production. MOSI (Museum of Space and Industry in Tampa), and the Tampa Lowry Park Zoo as well as the Miami zoo are also just a few of the other places that still have working Mold-A-Rama machines. Once I get my book done and my website revamped I'm going to dedicate a section to some of the research I did. I know, nerdy, of me, isn't it? But I just can't help it. These things were just so much damn fun. Almost as much fun as writing about one of them. I've been meaning to write this post for a while, but being that I'm in the middle of a book deadline, I'm lucky to be brushing my teeth right now (okay, I do brush my teeth several times a day, it's washing my hair that's taken a sideline). I know there are writers who don't read while they're in deep writing mode, but I'm not one of them. It would be like asking me to stop breathing. I simply can't. I mean, there has to be some kind of break in the day, and I always, always, always, read before going to sleep at night. 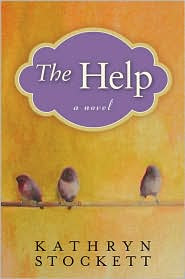 A few weeks ago I read The Help (a book that has intrigued me from the moment I first heard of it). I loved it. Absolutely loved it. I cried, I laughed and I mostly marveled at what a fantastic writer Kathryn Stockett is (which means I desperately hate her, of course) Seriously, Kathryn, if you're listening, you make me want to be a better writer. Thank you to all of you who entered and to all of you who have taken the time to write a review of my books, especially during the busy holiday season. It really means a lot!